So WHO exactly is trained here? Lightning: Ya... we're guinea pigs dummy. We're always hungry. Caramel: Yeah, but I'm sick of these pellets. Let's get those big people to feed us some actual vegetables. Lightning: Ok, but not that really tall guy. He doesn't understand us. We have to wait until that woman with the loud shoes comes home. Ooh... here she is now! Ready? Lightning and Caramel: Squeek, squeek... squeeeeek, squeeeeek... SQUEEEEEEEEK!!! Charli: What's that? Do I hear some piggies? Do you widdle piggy girls want some treats? Oh, here you go sweeties, have some yummy celery! It's reversed in our household. I think Dave feels guilty because he's away at work so much and he thinks the cats won't love him if he doesn't overfeed them. "No! You just ate! Come on, guys, don't give me that look. No means no. Oh, OK." sound of dry food hitting bowl. 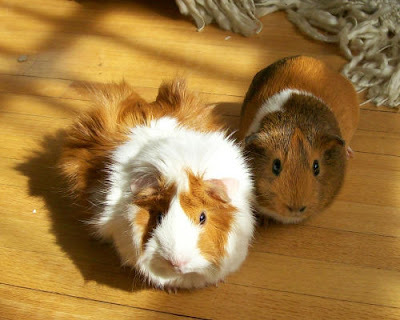 When we had Guinea pigs, our phone was in the kitchen, which was where the fridge was, which was what we opened to get the veggies to feed the piggies. So when the phone rang, the piggies knew someone was coming into the kitchen. Sounded like this: Ring, weet, weet, ring, weet WEET, ring, WEET, WEET, WEET! Awww, so cute. I love those little types of creatures. And the interesting names they always end up with ;) Poor Charli. Every time I walk past the cage our pigs squeek. I'm convinced they get fed more than twelve times a day by various members of the family. I think Caramel (on the left, right?) is squeaking louder than Lightning. It looks like she could stand to lose a few ounces. Wait a minute. Isn't celery supposed to have negative calories? I think she's being fed donuts by someone in your house. Check into it. The fluffy one on the left is so cute! sis - That Don. And they say you can't teach an old dog new tricks. whit - Pink Floyd would be proud. jd - So guilt food isn't just for people huh? mom thumb - Isn't that funny? Ours freak out if you open any plastic bag that sounds like lettuce, celery, spinach, carrots or any other kind of veggie. michelle - Lightning got her name on the first day we had her because she scooted away so fast we couldn't catch her. Now she's so fat she just kind of waddles around. dan - Only 12? Why are you withholding food? kathy - The ironic thing is, Lightning is the real pig. Caramel just looks fat because of her Don King hair style. janna - Thanks for the celery. They're finished with it already. They must be in cahoots with Emma's guinea pig, because as soon as I walk in the kitchen she runs of out her pigloo and squeaks with as much energy as she can muster. Oh, yeah, Bacon is the same way. Except it's Jim who is the soft touch at our house! She wheeks, he feeds. She goes berserk on me when I bring home grocery bags and there's major plastic rustling. I keep telling her, "It says Guinea Pig food RIGHT ON THE BAG! See! You can eat it!" She's not buying it. She will nibble at the pellets when they're cold out of the fridge, but that's about it. Ahahahaha! We "guinea pig sat" for friends once. That thing would make the wierdest noise every so often. Then we figured out it only made it when the fridge door opened.